Tank Girl is a 90's British indie comic about the misadventures of a gentle young lass in post apocalyptic Australia and her mutant kangaroo boyfriend Booga. I wrote "Buy Milk" on my leg. Tank Girl was very good at her job in the Army driving a tank, being loud, obnoxious, and blowing stuff up. Then she missed making a delivery of colostomy bags to the President. 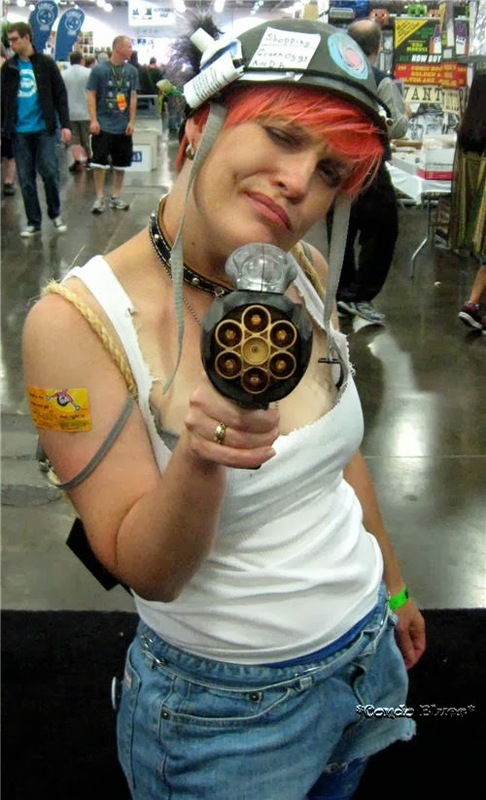 After a messy public potty problem, the Prez declared Tank Girl an outlaw. Tank Girl has been having misadventures driving a tank, being loud, obnoxious, and blowing stuff up on her own ever since. Crazy, loud, stream of consciousness misadventures (and Booga likes The Ramones.) Can you see why I love her? Husband thought it was funny I stayed in character while eating. That's the beauty of Tank Girl. I was starving and tired at the time. Method cosplaying? I took my look from the comic We Hate Tank Girl, what was in our costume closet, and cutting up my now too big painting clothes. There are a few things that scream Tank Girl like the target and "Aim Here"graffiti on her helmet, the ripped clothes, boots, the checker b*mb, bandaids, and ridiculous weapons. Tank Girl's helmet and look changes from panel to panel in that book so I hoped people would get it. They did. A Doctor Who told me the rocket tied to my back made him happy. Yay! Do you want a tutorial on how I painted and made my Nerf gun mod? I think I spent all of $15 on this costume. I bought a kid's plastic helmet on eBay and painted it army green. I bought a Nerf knockoff and painted that too. I made the fake b*mb from trash. Ironically, our historic costume pieces came in handy. I wore the tank top under my corset to prevent corset bites and the stockings are 18th century. I can write a tutorial how I made this b*mb/rocket from a soda bottle if you are interested. Cosplayed Captain Hammer from Dr. Horrible's Sing A Long Blog! 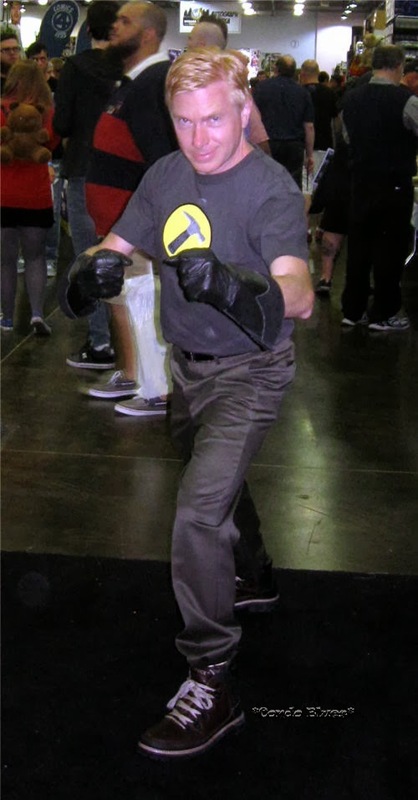 He has Nathan Fillion's Captain Hammer look down! Cosplaying is a lot like being a street character at the renaissance festival but without staying in character all of the time, sometimes not at all. We geeked out with people we met about costumes, who we cosplayed, and how we made what. We took and posed for a bunch of photos. The mash up photos were the best! 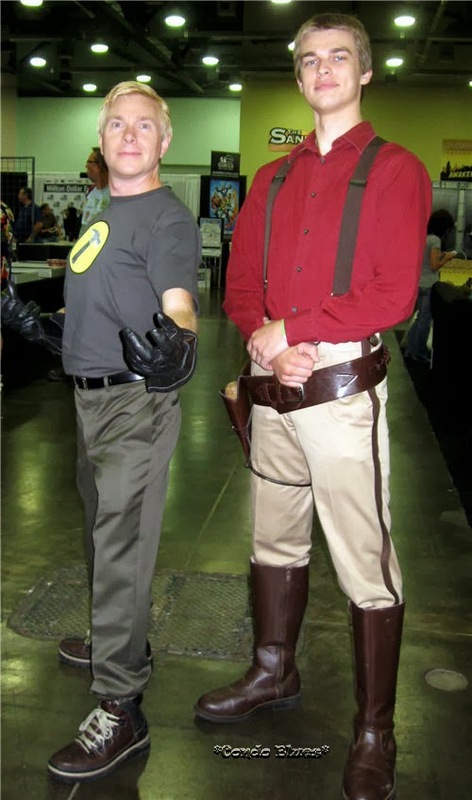 Two Nathan Fillion characters created by Joss Whedon. Captain Hammer and Captain Malcolm Reynolds from Firefly. 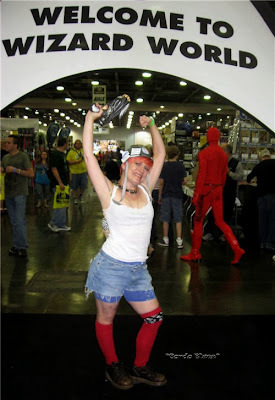 After cheering on my friend Holly on Heros of Cosplay, I was nervous about dressing up. The show portrayed cosplay is all about winning a costume contest, full of drama, and that everyone will hate you if you don't show up in a screen worthy costume. and coordinated the two to make it happen. That's another reason why I did my first cosplay as Tank Girl. If people went all drama on me, the costume would encourage me to go into character and tell the jerk to jump off a cliff because we are dressing up like cartoon characters. It is supposed to be fun! 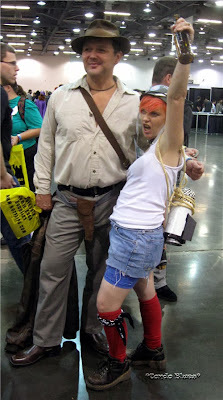 Me, Indiana Jones, and another another prop from the trash. I removed the label so it looks like a disorderly Tank Girl beverage rather than a root beer beverage. Fortunately, as I suspected, the show was a lot of editing from people who know nothing about this hobby to make manufactured drama. 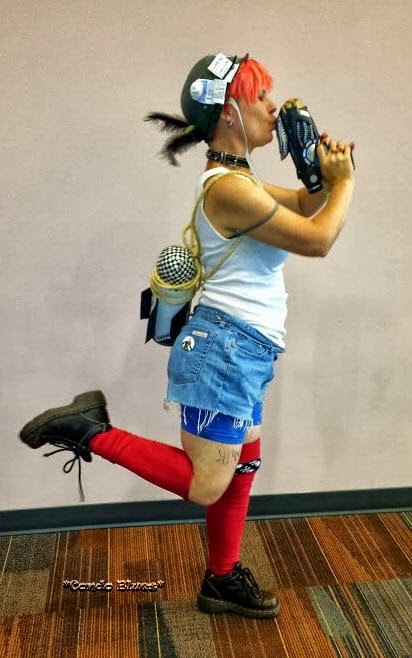 In my experience everyone was 100% awesome even if they didn't know Tank Girl. 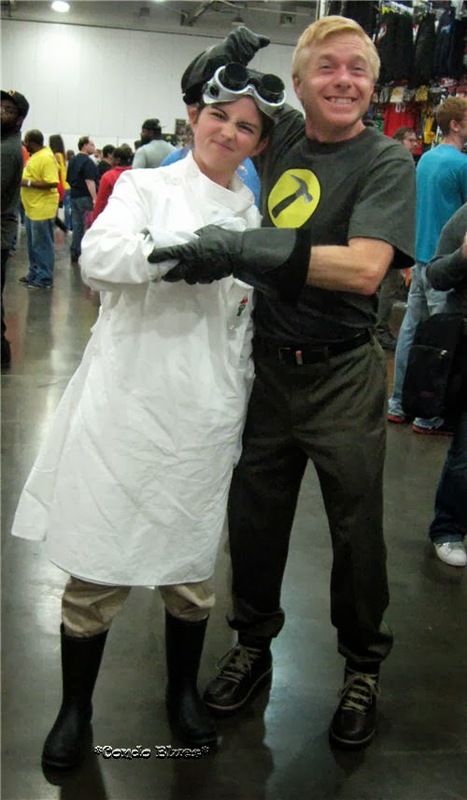 The costume contest is only one part of the convention and not everyone does it. You win a trophy and bragging rights. The only time money prizes are available is if a reality TV show is involved. We opted out since we did our costumes for fun. Because really, who wants to do a lot of hurry and wait a hallway for a contest, when you can be out on the floor geeking out with everyone else like this? Husband calls this photo, "My girlfriend can blow up your girlfriend." I'm already planning for next year. Who should I be?